The name of Longuet-Higgins has disappeared from the net. Yet it seems to me that this would be an utter neglect in the present context. So I present from my archive the originals which were in the net till August 2001. If there would be any new net-references, URLs, please be so kind as to tell me. Longuet-Higgins in 1955 at the Austin, TX meeting. English theoretical chemist whose main contributions have involved the application of precise mathematical analyses, particularly statistical mechanics, to chemical problems. Longuet-Higgins was born in Kent and studied at Oxford. He was professor of theoretical physics at King's College, London, 1952-54, and professor of theoretical chemistry at Cambridge 1954-67. He then went to Edinburgh University to study artificial intelligence and information-processing systems, which he thought had a closer bearing on true biology than purely physiochemical studies. In 1974 he moved to Sussex University, where he expanded this field into studies of the mechanisms of language and the perception of music. 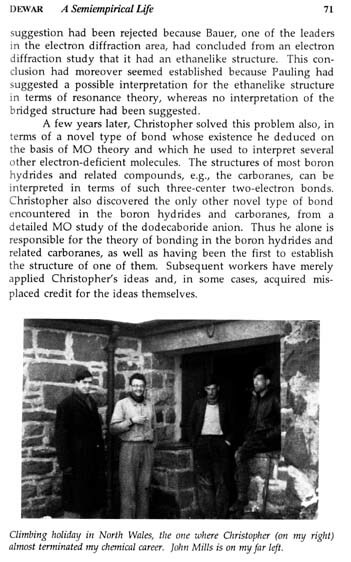 Longuet-Higgins successfully predicted the structures of boron hydrides and the then unknown beryllium hydride, and the existence of the ion (B12H12)2. 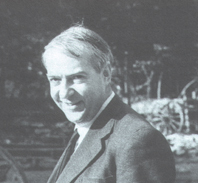 In 1947 Longuet-Higgins developed the orbital theory of conjugated organic molecules, deriving theoretically results that had been known experimentally for decades. He showed how the properties of conjugated systems can be derived by combining into molecular orbital theory a study of nonbonding orbitals. He formulated a theory to describe the thermodynamic properties of mixtures, which he later extended to polymer solutions. He also investigated the optical properties of helical molecules and worked on electronic spectra. From 1954, he used mathematical techniques to make theoretical chemical predictions. He predicted, for example, that cyclobutadiene (which had defeated all attempts to prepare it) should exist as a ligand attached to an atom of a transition metal; such a compound was successfully prepared three years later. In a larger piece of work, he applied group theory to define the elements of symmetry of nonrigid molecules, such as hydrazine (N2H4), and thus was able to classify the individual quantum levels of the molecule. 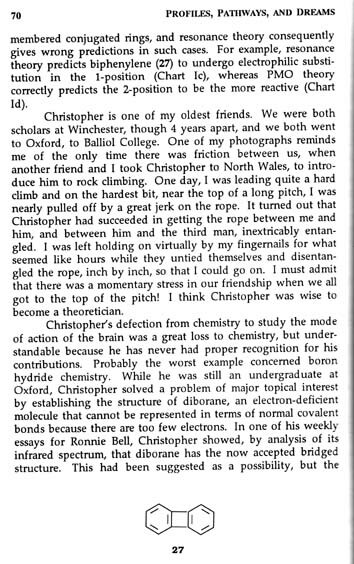 Christopher Longuet-Higgins, FRS, University of Sussex, U.K.
Christopher's career began as a theoretical chemist applying a more rigorous use of quantum mechanics to chemistry than had heretofore been customary. 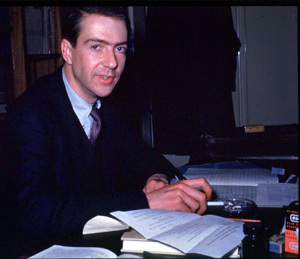 Having done all the chemistry he wanted to do by the age of 40, work that was recognized by his election to be a Fellow of the Royal Society, he joined Donald Michie and Richard Gregory in founding the Department of Machine Intelligence and Perception in Edinburgh University in 1967. Christopher brought a thorough knowledge of the mathematics of the continuum to enrich that environment, and it has always informed his work in Artificial Intelligence, together with that of some at least of his students, of whom Geoffrey Hinton is perhaps best known. Christopher has worked on various aspects of perception, including pose-recovery in machine vision, speech and the perception of music. His work on developing computational models of music understanding was recently recognized by the award of an Honorary Doctorate of Music by Sheffield University.